Maire EXC1, CQ, JunCAC, BOB, BOG2! Padmé EXC1, CQ, JunCAC --> Russian Junior Champion! Maire EXC1, CQ, JunCAC, BOB, BOG1, BIS6 --> Russian Junior Champion! We had fabulous and immemorial weekend in Norway, thanks to our company in the show ring and by the side of it: Zelina and Pia!!! 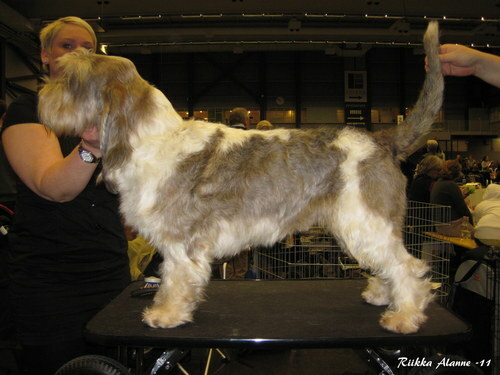 Dinetten Glitter Gonzesse “Tiuhti” HP 1 -> ROP-pentu / BOB-puppy! Dinetten Glitter Guerrier “Mökö” HP 1 -> VSP-pentu / BOS-puppy! 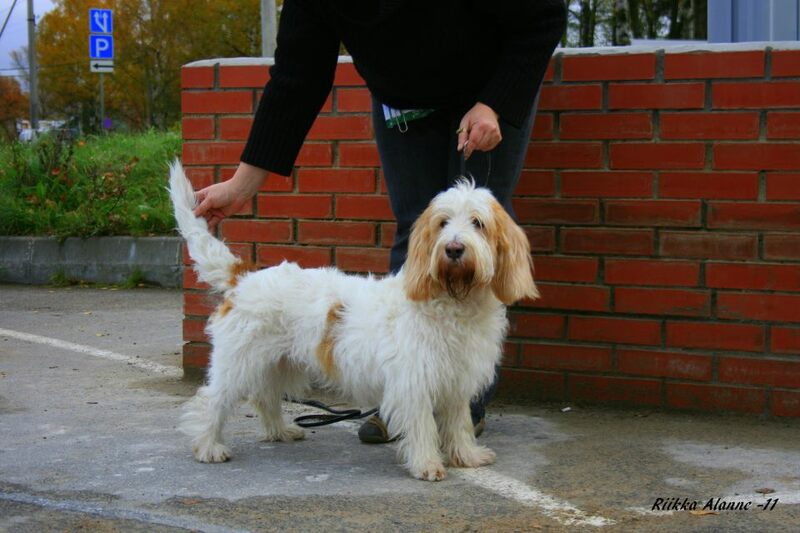 GLORIEUX DES TAILLIS DE CHENES "Loisto" 1 HP BOB-puppy, judge Matti Luoso. 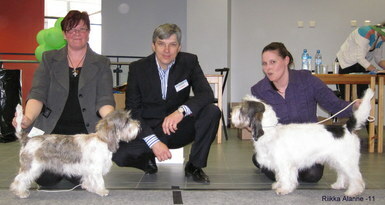 Judges were Mrs. Nijole Zieniene and Mr. V. Beljakov. 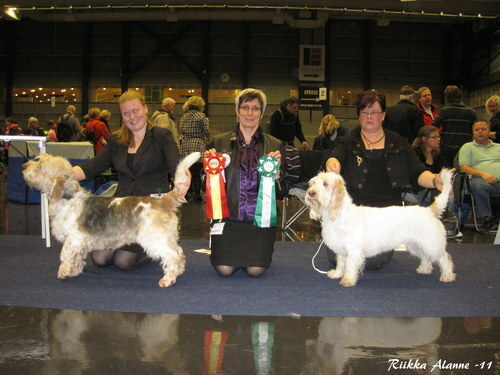 Little miss Padme got her two Junior CC´s and was BOB-Junior in both shows. 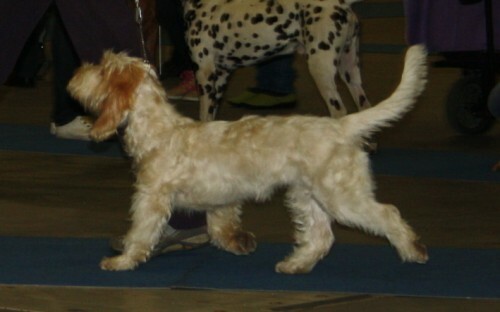 Lady Selma got also two CC´s and will become now Russian Champion, if I have counted correctly...??? 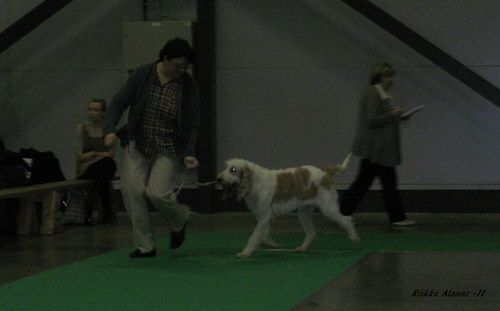 Selma was also BOB in second show, handled by Riikka. 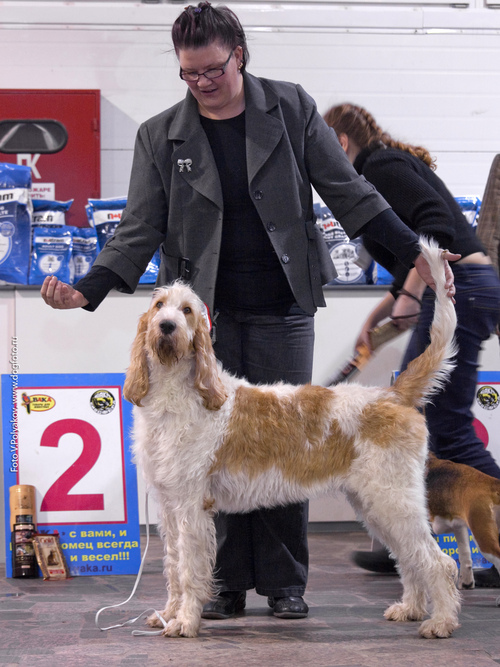 Guest star Elli (Maires and Meeris sister) was with us too. 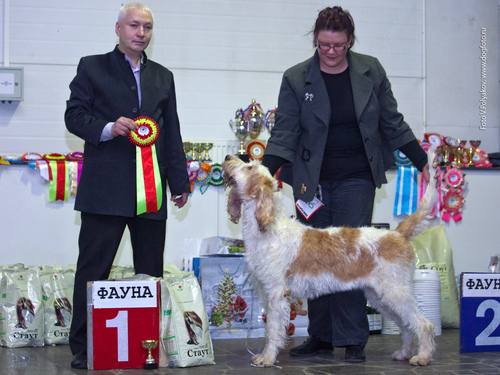 She got two CC´s also and becomes Russian Champion too! Elli was BOB in first show. Not bad day at all! We have sunday-rule: we are not staying in groups if there is any success during the day. Because driving time to border and customs formalities takes time from 4 to 5 hours. So no group results today. 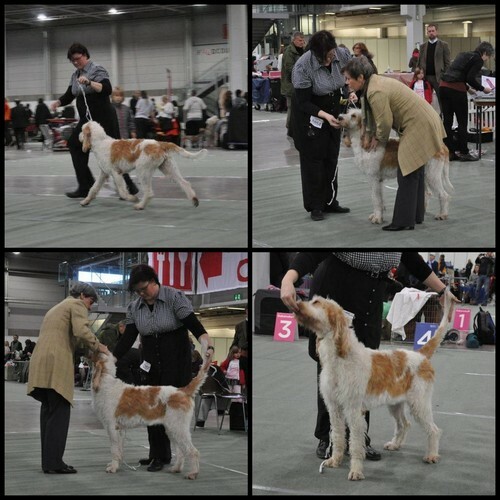 Mooris,IW-boy, was BOB-Junior in wolfhound ring. MrX got Exelent1, ВD1, CC and ВOВ and becomes FI CH!!! Thank you Mia Piri to showing MrX in Tuulos! 1.5.2011 Nice week end in St.Petersburg, Russia. Cevi was BOB, BOB-jun, got jun-CC and become RU Jun-CH. Paku got CC and become RU CH also he got his last Cacib and is now waiting C.I.B -title! Way to go Paku! Congrats to Mia and Mika! Dinetten Grand Florencio EX2 and Unitee du Greffier du Roi EX2. 26.4.2011 Myy was in ultrasound and result is positive! 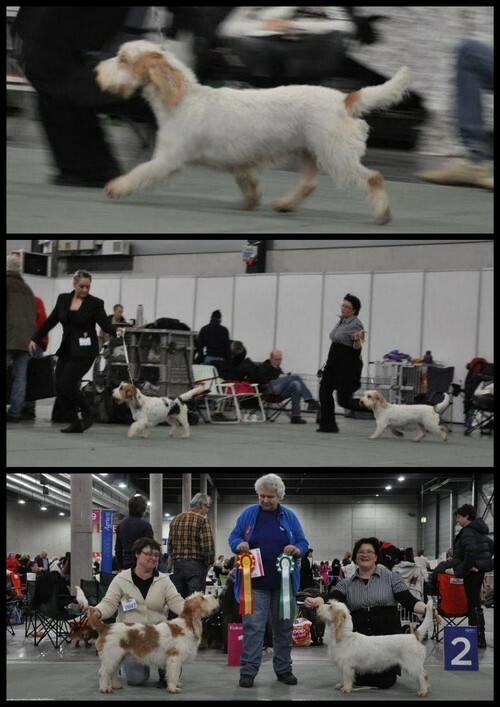 Puppies are expected in week 22. Luca L´Honneur du Pied EX1 CQ, BOB and Dinetten Grand Faucille EX1 CQ, CC & BOS. 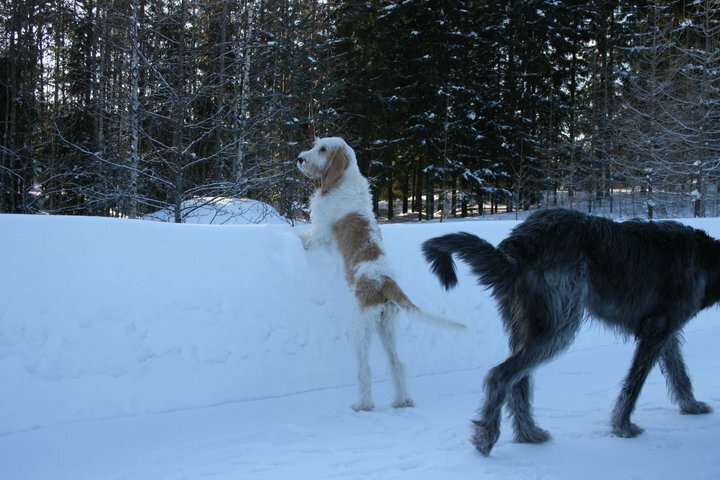 17.02.2011 This whole winter has been so snowy (70-80 cm) and really, really cold that We haven´t had change to hunt with our GBGV´s at all. We have hopes that rest of winter is much more favorable to us and our dogs. Our GGV has shown good ability to go in high snow. This year has started very nicely. 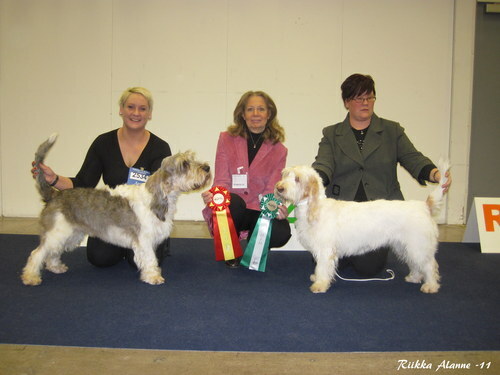 2 X INT dog shows at Göteborg, Sweden. MrX EX1 (CC qualification), BD2, Res-CACIB and Myy got EX1, (CC qualification), BB1, CACIB and was BOS. The BOB was Åkerös Grand Calle. 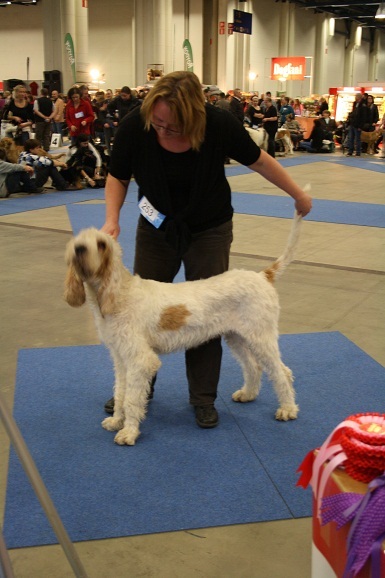 Our dogs cannot receive CC´s in Sweden cause they do not have hunting test results. Congratulations to Zelina! MrX got EX1 with HP and Myy repeated previous result. Calle was BD2 and got res-Cacib. 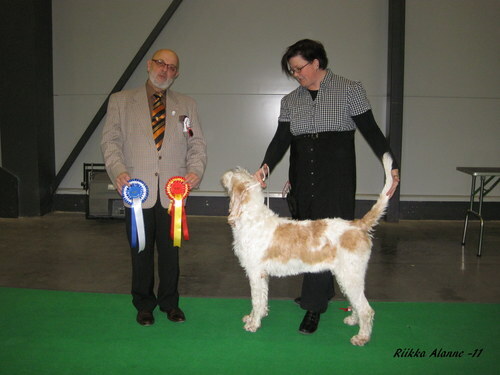 Best Dog and BOB was Booster vTT. Congratulations to Monica! Booster is now C.I.B.